These three works of art were auctioned off at Village Chapel Presbyterian Church in Charleston, WV, and raised more than $2,000 for one local and one national initiative working to help children. The Rev. Dr. Amy Parker has a love of the arts. So much so, she not only has her Master of Divinity degree, but she also went back to seminary 30 years later to get her Doctor of Ministry degree in Arts and Theology. As the Minister of Education and the Arts at Village Chapel Presbyterian Church in Charleston, WV, Amy is now doing all that she can to inject her passion into the congregational life and surrounding community. Fortunately, the church’s pastor, the Rev. Dr. Todd Wright, shares her vision. Their first project came to fruition in early December with an art show and open house at the church. It concluded with an art auction in early January that raised more than $2,000 for one local and one national initiative working to help children. Village Chapel is certainly headed in the right direction for this to happen. And it all stems from an idea Todd had as a result of the Visiting Artists Series that was part of Amy’s 2015 Sabbatical. Three artist-theologians were invited to lead the congregation in worship around the themes of “Art and Worship,” “Art and Service” and “Art and Outreach.” The leaders also conducted workshops after the service that centered on art mediums like cement luminaria, storytelling and even paper-tearing. The idea was the church building could offer an opportunity for an artist to display his/her work where the community could gather and maybe even buy the art. As time passed and the idea continued to create momentum, it was eventually decided that a theme would revolve around Christmas and the Advent season, with thoughts turning to commissioning several artists to create specific, original artwork for the event that could then be sold. All proceeds from the auction would benefit worthy causes. Having an artist the caliber of Ian Bode added credibility to the event and helped bring in other artists for the show. It led to increased awareness for the event through a front-page newspaper article and radio advertisements. 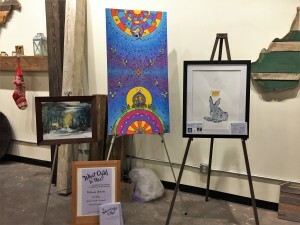 His connections also led to all three pieces being displayed at a monthly art walk in downtown Charleston that, again, helped bring attention to the upcoming auction at Village Chapel. View a booklet here that describes the works of art and profiles the artists. Once the three artists were in place, they were given a common theme of “What Child Is This?” with which to work. While the trio could have chosen any medium to use to create their art piece, they all decided to do a two-dimensional work rather than something like sculpture. 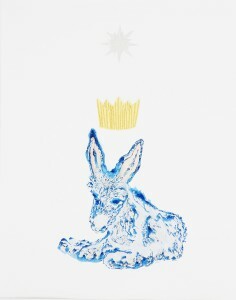 “Each of them talked about the underpinning of their theology and how that came through in their paintings,” Todd said. For Staci Leech-Cornell, who is known for her sculpture, her work featured a resting donkey with a gold crown over its head underneath a star. While not as colorful as the other two works of art, this mixed media piece contained unique texture that included stitching and layers of ink that helped bring the objects to life. 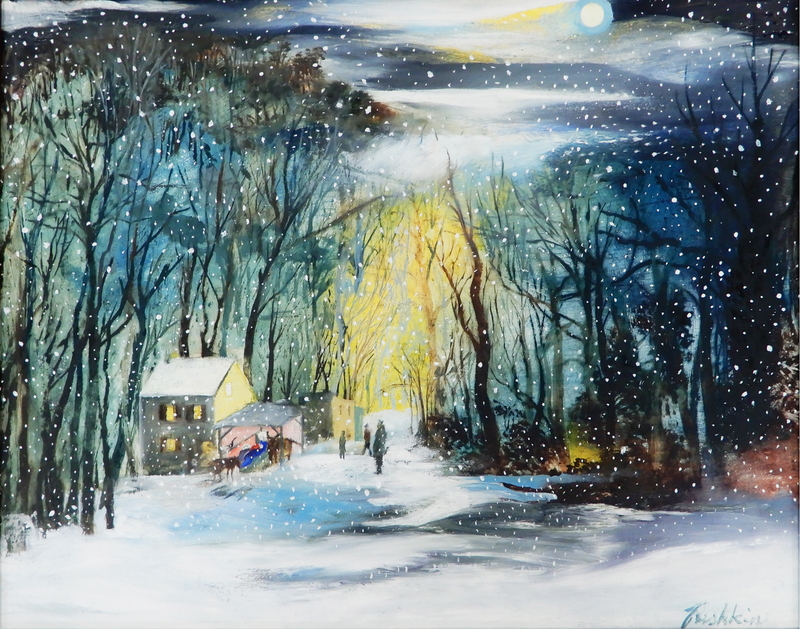 David Pushkin’s work depicts a wintry scene of a house in a wooded area, a place in the greater Charleston area he passes regularly during his commute to and from the high school where he teaches. He is known for designing the stained glass at a local synagogue he attends. 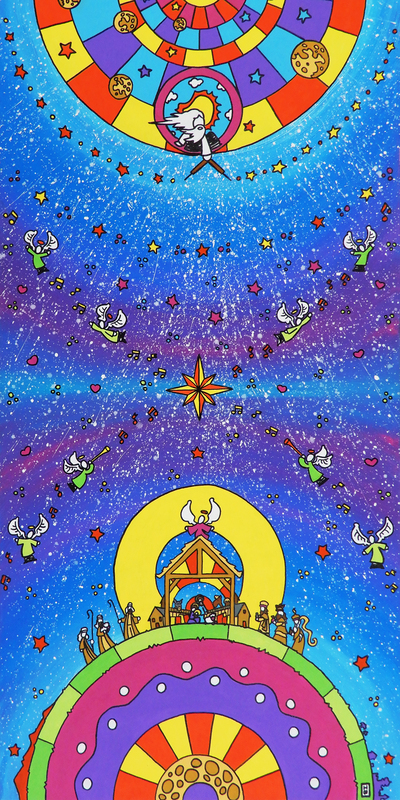 Ian Bode painted a nativity scene that “purposely draws a parallel between what God is doing in the heavens and what God is doing in the earthly sphere,” Todd said. Angels are shown as the intermediaries between those two worlds, he added. An open house in early December included an artist’s reception and local cuisine, allowing for the pieces of work to be unveiled and people to also interact with the artists. It brought many people from the community into Village Chapel’s fellowship hall, which was also the site for the live auction one month later. In the month between the open house and the auction, the artwork remained in the church’s fellowship hall for viewing, allowing for time for worshipers and others to become more acquainted with it. At the auction, the bidding for the three paintings started at $200 each but ended up selling for between $500-$600 apiece. After individual contributions were factored in, a total profit of $2,030 was accumulated. Half of the money went to Lily’s Place in Huntington, WV, which provides medical care to infants suffering from Neonatal Abstinence Syndrome and offers non-judgmental support, education and counseling services to families and caregivers. The other half of the funds raised went toward Presbyterian Disaster Assistance work at the Mexican border. PDA is providing humanitarian assistance for families with basic needs, legal orientations and family reunification assistance while also advocating for more humane treatment by the U.S. government. “Folks really responded well to those two recipients,” Todd said. “They liked the idea of there being a local component, and Lily’s Place is doing really good work tied to ministry with children. And we did a more international recipient in PDA’s work with children separated from their families at the border. Amy and Todd hope to make this an annual event and are already looking toward next year. They plan to use photos of the three pieces of artwork to create Christmas cards that will be sold next year. So, what was years in the making and began without anyone really knowing how the art auction would fare has turned out to be a masterpiece that has the potential to only grow in the coming years.